Villa Rainbow would like to welcome you in this charming, exclusively gay male, and tropical environment. You will enjoy superb and spacious rooms, and a large mosaic-tiled swimming pool, in full intimacy and tranquillity. 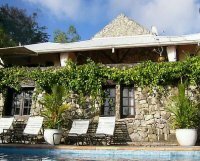 Villa Rainbow is a fully private villa, or 'guesthouse', located at Pic Paradis, the island's highest point, with incredible views and sunset, and only 2 minutes from the sea! Our guests say our location is perfect, close to many of the island's best beaches, trendy and crowded or more secluded and hidden, between Cupecoy, Marigot, Grand Case, and the famous Orient Bay. They come from all over the world. So far, we had guests from 38 different countries! Meet new friends! Live our island's life, have fun, get a tan on an isolated beach, take a well deserved rest with your lover, swim in our large clothing optional pool, have a massage in the garden, meet great artists, discover the island's secret places, sip a glass of wine or the famous ti-punch with the other guests at the end of the day, facing the sunset, and enjoy the extraordinary view of the Caribbean sea. Taste the friendly island, walk to the hidden places of the Natural Reserve or Colombier area. We could guide you for sport activities (hiking, sea kayaking, snorkeling, sailing) and other occasional events (restaurants, concerts, art exhibition, meeting artists etc. Short visits to nearby islands (Saba, Anguilla, St Barth) are possible and we will help you to organize that efficiently. Your hosts, Chris and Jean-Louis, gay couple living in the Caribbean for more than 15 years, will offer you an unforgettable and personalized stay, providing you with all information you may need for a dream holiday ! Jean-Louis, banker during the day, is an avid orchid collector and passionate about them as well as palmtrees and tropical flowers. Chris spend most of his free time sculpting the male love.